This concert will also be performed in Juneau, AK on March 15. Join us for an evening of joyful Mozart! 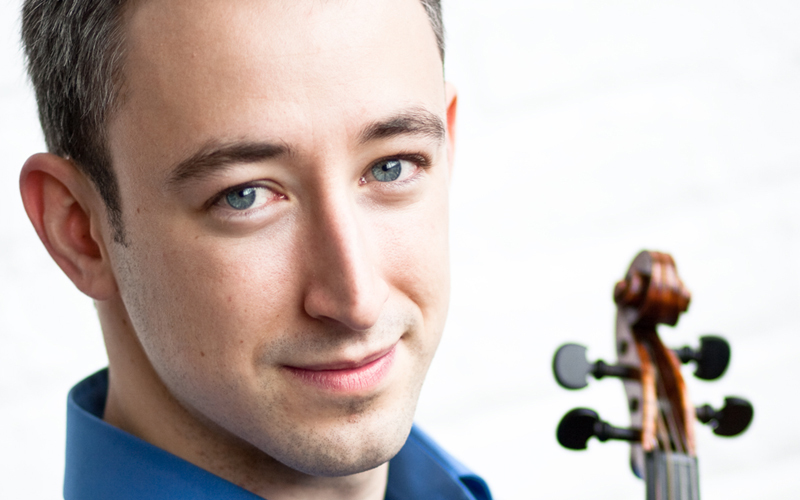 Boston-based violinist Jesse Irons, previously heard here with the ensembles A Far Cry and Gut Reaction, teams up with Byron Schenkman for three favorite Mozart sonatas (K. 302, K. 454, and K. 526) plus a Sonata in D Major by his exact contemporary Francesca Lebrun. Mozart’s sonatas have a special place in the evolution of the 18th-century violin sonata. At the beginning of the century most violin sonatas were solos for violin with continuo accompaniment. Then musicians began adapting trio-sonatas (sonatas for two melody instruments and continuo) into sonatas for one melody instrument plus keyboard, in which a violinist could play one of the upper parts with the keyboardist taking the second part in the right hand and the continuo part in the left. Next a market developed for accompanied keyboard sonatas, music suitable for amateurs in which an accomplished keyboard player, typically one of the women in a family, was accompanied by a less accomplished violinist, likely one of the men who were presumably busier with other matters. Mozart borrowed elements from all of these and came up with a new type of duo sonata in which both players are constantly shifting roles from soloist, to accompanist, to duet partner. As such they are extremely rewarding to play and delightful to hear. Mozart composed the Sonata in B-flat, K. 454, for a performance in Vienna in 1784 with the virtuoso violinist Regina Strinasacchi, a former a student at the Ospedale della Pieta in Venice where Antonio Vivaldi taught and where Anna Bon had also been a student. According to legend Mozart didn’t have time to write out the piano part so he played from blank pages, causing embarrassment when the emperor, Joseph II, asked to see a copy of the score. The Sonata in E-flat, K. 380/374f, dates from 1781, Mozart’s first year in Vienna, and is from a set of six sonatas dedicated to Josepha Auernhammer, one of Mozart’s piano students. Auernhammer was supposedly in love with Mozart who wrote to his father in rather excessive detail how repulsive he found her. At any rate he appreciated her musicianship and performed his sonata for two pianos with her. Francesca Lebrun was a renowned opera singer based in Mannheim. Her twelve sonatas for keyboard and violin, published in London and reprinted elsewhere in Europe, are beautiful examples of the late 18th-century accompanied keyboard sonata. Mozart’s Sonata in A Major, K. 526, was composed in 1787 while he was working on the opera Don Giovanni. In this sonata as in his great operas Mozart shows an exceptional ability to layer multiple emotions, with elements of joy and sorrow, comedy and pathos.